During October 2011, actress and singer Mamie Parris joined Wicked national touring company taking the role of Elphaba, the green-skinned and highly sympathetic witch first brought to Tony-winning life by Idina Menzel and later played by, among others, the Beaverton-bred Shoshana Bean. It doesn’t have any effect, she said, on how she approaches her part in “Wicked,” which comes to Portland on Tuesday to begin a lengthy run at Keller Auditorium through April 08, 2012. What has it been like taking over such a famous role? When you take over any role there’s some pressure there. But to be honest, I’ve been so supported since I came in here. Everyone in the company has been really lovely and great to work with. Do you have any little ways you’ve used to make Elphaba your own? There’s not a grocery list of things I do, like saying this or that line in a particular way every time. To me, that’s not how acting works. It’s just bringing what I have to the character and making a real connection with the story. This is one of the hardest jobs I’ve ever had in my life. Yes, the singing is a challenge, but if you’re a healthy vocalist, it’s something you can do. What’s difficult is how physically and mentally exhausting a role like this can be. Elphaba hardly ever leaves the stage. And in those few times she’s not in a scene, there’s something I have to be doing backstage, like a costume change. It takes everything out of you. Among the stronger threads in Gregory Maguire’s novel, and still present in the musical, is the question of who really is good or evil and how they come to be viewed one way or the other. What’s Elphaba’s good-to-wicked ratio? I don’t know if that’s something that can be put in a mathematical way. Maybe it’s different for someone at different points in their life. It really is a long journey to self-discovery, and we make so many changes to what we think and feel and believe all through the process. So for Elphaba, too, it’s about the journey. And I think that’s why the show continues to connect with so many people so strongly. The show of course has been a big phenomenon with young audiences. What kind of responses do you get from those fans when you interact with them? I meet a lot of fans when I leave through the stage door. It’s amazing how much people walk away affected by it emotionally. Here it is this story set in a big, fantasy world, but people see it as something really personal. The thing that’s surprised me most is that it’s not just young fans. I meet older people, couples on dates, guys who bought tickets because of their wives and didn’t think they’d enjoy it themselves. It’s always thrilling to me to meet people who are completely new to the show and see how much they get into it. What haven’t I asked you about that I should have? The No. 1 thing people ask me about is the makeup. It takes about 25 minutes. I have a makeup artist who helps me put it on before the shows. It’s water-based, actual makeup, not a body paint, so that’s good. But even so, I can be away from the show for four days and still find a little green behind my ears. I forever carry a bit of Elphaba with me wherever I go. 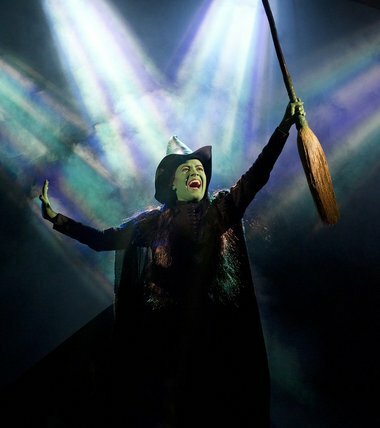 Wicked will be performing at Keller Auditorium through April 08, 2012. Get $10 OFF on Wicked Portland OR Tickets Orders of $350 or more! Use Code #SpringSavings at Checkout!